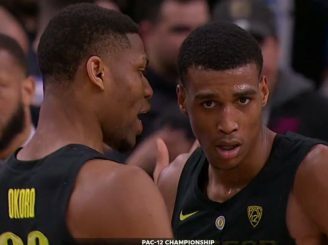 Oregon’s defense is what got them into the NCAA Tournament, and it’s their defense that can carry them to the Sweet 16. We’ve touched on the brilliance of Coach Dana Altman’s defensive schemes all season. Today we present a deeper look. “The Chameleon” looks like one defense, morphs into another, then shows itself as even another — sometimes in the same possession. Wooten has 153 career blocks, good for 30th all-time in the Pac-12 after just two years. The Ducks would like to get steals out of their press, but it’s primarily designed to disrupt the opposing offense and prevent it from going straight into its set. With a long, athletic defender at the top of the press, Oregon forces the ball from side to side as the ball comes up court. Ordinarily, this type of defense is vulnerable to two quick passes and a drive to the hoop for a layup. 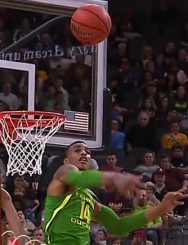 But this Duck defense isn’t ordinary; it has length and legit shot blockers at the rim, waiting for those courageous enough to drive. Kenny Wooten may be the nation’s best shot blocker, and Francis Okoro is a mountain of a player to get through. Miles Norris can get up with the best of them as well. So the opponent backs it out and Oregon slides into its matchup zone defense. Length. When Altman took Will Richardson out of the starting lineup and inserted Okoro, Oregon’s defense became lethal. Louis King is 6′ 7″ with a 7-foot wingspan. Wooten stretches out over 7’2.” Paul White reaches out to almost 7 feet, and Okoro also has about a 7-foot reach. When those guys put their arms out, it’s a sea of problems. Okoro and Wooten bring NBA size to the Oregon defense. Even Payton Pritchard often has a size advantage at the point. And when Richardson enters, he also has more length than average, at 6′ 4″ with a 6′ 7″ reach. We’ve always known they had this physical advantage. The difference now is that they’re all playing as one, and have made defense their identity. Just as in football, when someone runs across the defense and no defender goes with him, that’s a zone. All of this length allows Oregon to sag an extra step back from shooters, protecting the lane and preventing penetration. Simultaneously, it allows them to recover and get a hand up on shooters without having to take an extra step. During this run, Oregon has also done a great job of helping, and then helping the helper, rotating and rotating again on defense. The Ducks are forcing teams to make not one extra pass, but two. Most college players don’t have the patience for that, and they wind up taking the contested shot. Altman stated recently that teams were shooting about 17 percent on contested shots against the Ducks. Why? Again, the length. You can extend your arm faster than you can move your feet. Two things happen by February for most Altman teams: they’ve watched a ton of film on opponents, and they’ve learned how to talk to each other on defense. The intensity of doing all of this together takes time. One mistake and someone is wide open for a clean look. If everyone talks, and everyone knows the same offensive traits of the opponent, Oregon is very tough to get consistently good shots against. The Ducks are all smiles after their dominant defensive performances. 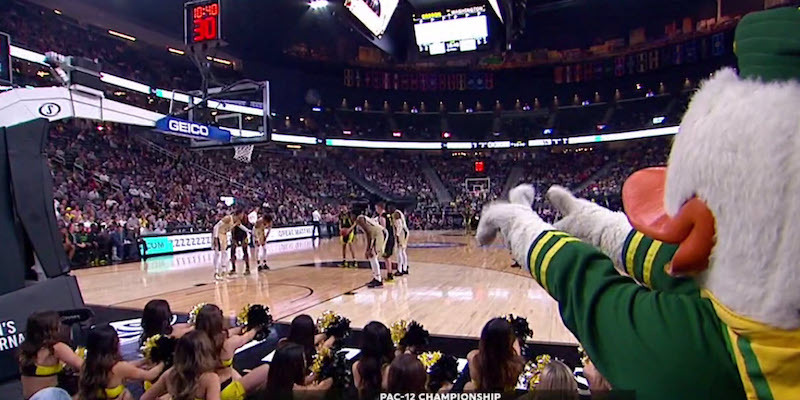 Oregon packs their defense back into the lane, so you would think a shooter with deep range and a lightning-quick release would cause Oregon’s zone fits. Not so. Smart teams will run a small forward to the high post and feed him the ball where he can turn and shoot, kick it to the wing or drive. 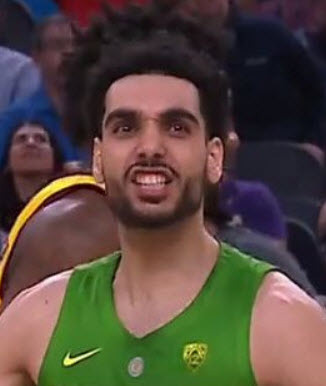 (Oregon ran this same offensive set to perfection with Dillon Brooks.) But that takes patience. Offenses have to move the ball side to side enough times for that spot to be open, and then hit it with the pass right away. The Ducks defend that by swarming to the ball and using their length to prevent passing back out. Quick passes can hurt them, but most teams don’t have passes good enough in the high post, or they just don’t run that style of offense. If they do all of these things, I like Oregon’s chances in these first two games.